Did you know this year we celebrate the 99th anniversary of the National Sovereignty and Children’s Day? 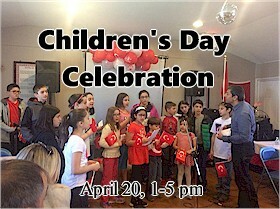 Also known as 23 Nisan, Ulusal Egemenlik ve Çocuk Bayramı, make sure our children understand the importance of this cultural event. TACAM Building, 28837 Beck Rd. Wixom, MI. This year we put more effort to make this day a memorable one for our children as well. We are happy to announce that it is going to be an exciting day for everyone with the performances of our children in the community. They will sing Turkish songs, play instruments, and perform folk dances. If you have folkloric costumes, please have your kid(s) dressed up, otherwise have them worn red and white t-shirts. There will be free ice cream and cookies. This is a free event, donations are well appreciated. This entry was posted on Thursday, April 4, 2019, at 2:14pm	and is filed under Main Events. You can follow any responses to this entry through the RSS 2.0 feed. You can leave a response, or trackback from your own site.